This repair manual covers Toyota Land Cruiser wagons, utilities, hardtops, troop carriers and cab chassis in the FJ and RJ series built from 1969 to 1990. It includes 40s, 55s, 60s, 70s and Bundera. All of these models are featured in these manuals, just what you need when contemplating a trip. We have covered all the information the enthusiast needs from, a grease and oil change to a full rebuild. 21R, 21R-C & 22R 4 Cylinder. # Manual Transmission: 3 Speed J30: 4 & 5 Speed H41, H42 & H55F: 4 & 5 Speed G40 & G52F. # Front Axle and Suspension. # Rear Axle and Suspension. # Radio and Stereo Tape Player. The Toyota FJ40 is the model designation for a Toyota Land Cruiser 40 series made from 1960 until 1984. Most 40 series Land Cruisers were built as two-door vehicles with slightly larger dimensions than a Jeep CJ. The model was also available under the BJ40 / 41 / 42 ( short wheelbase ), BJ43 / 44 / 46 ( middle wheelbase ) or HJ45 / 47 ( long wheelbase ) designation where it had a Diesel engine. * 1973 – HJ45 launched with the H , 3.6 litre in-line 6 cylinder Diesel engine. * 1974 – BJ40 / 43 launched with the B, 3.0 litre in-line 4 cylinder diesel engine. A factory-fitted roll bar becomes standard in the United States. * 1975 – Rear barn doors are added to US model FJ40s. The lift gate remains available as an option in other countries. 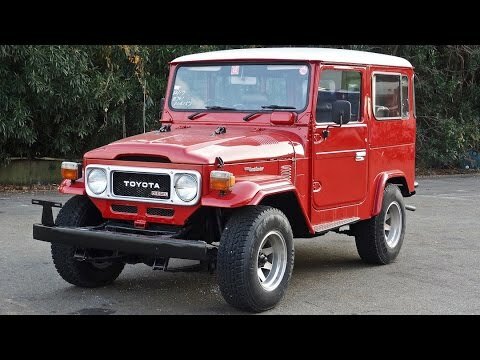 Over the years Toyota has changed the engines used in the FJ40 series. The B series motor is a 4 cylinder diesel, and the H series a 6 cylinder diesel. For example, the F and 2F engines share many of the same parts. However the H and 2H engines have almost nothing in common. There are individual models within the engine series, for example, there is an F125 engine, and an F155 engine, all in the F series with different power ratings. While not legal, most FJ40 series vehicles could have their roof and doors removed. With a folding windshield this allowed for complete open-air experience.